Nord Piano 3 Reviewed - Is this the Ultimate Piano? 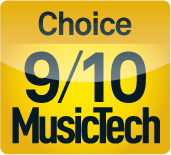 Nord Piano 3 Reviewed – The Ultimate Piano? Nord certainly made the right choice when it decided to make its keyboards red. I’m not sure if there are more professional keyboard players using them compared to the black keyboards made by other companies, but that’s certainly the impression you get from watching TV. From the Nord Lead onwards, the company has become synonymous with quality. If it does virtual analogue, it does it better than anyone else; likewise with ‘real’ sounds – the Nord sound library is probably the best in the world. And when it comes to keyboard quality? Well, the last one I tested was the Stage 2EX, and it took me nearly a year to return it – it really is that good. However, with the quality, of course comes the cost. Nords ain’t cheap, and the likes of Roland and Yamaha are constantly nipping at those red heels, upping their specs while keeping their prices tantalisingly lower. And talking of keys, it really is the keyboard that sees the biggest update. The Piano 3 has an 88-note ‘Triple Sensor key bed with improved grand weighted action’ and features Nord’s Virtual Hammer Action Technology, ‘for greatly improved key response’. Essentially, the company is aiming for the perfect feel of the hammer movements within a grand piano, for a price that might seem high to some, but is much lower than the real thing. 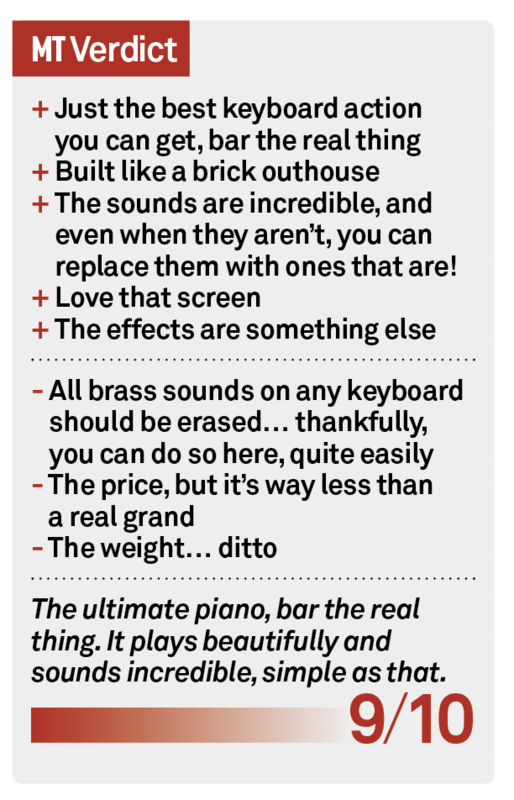 Unpacking it, you’re immmediatley aware that the Piano 3 is heavy – again not as heavy as a real grand, of course, but something worth noting if you are a gigging player. We’ll come on to how the improved keyboard works in practice shortly, but to give you some idea of what the company is aiming for, we’re talking about extra sensitivity across the board. There are improvements in note transitions and repetitions thanks to that VHAT, whereby notes can be triggered without lifting them totally – so it’s ideal for certain playing styles (percussive and pianissimo in particular) as it allows you to get a much more dynamic response over different velocities. It makes for smoother transitions between notes, too, as the dampening you might get on other pianos doesn’t come into force so much – notes linger for that bit longer as you restrike. Other new features include a fantastic OLED display – very de rigeur on the best keyboards these days. Once you use it, you realise it’s something that really did need updating and we hope to see it featured across the range on all Nord keyboards. There’s 1GB of piano-type sounds included on the Piano 3, including six grands, five uprights, nine electrics, synth pianos, clavinet and harpsichord. On top of this you get an additional 256MB of sounds which include vintage Mellotron and Chamberlin plus synth patches that can be controlled via the dedicated Sample Synth section with controls for adjusting Attack, Decay/Release and Dynamics. All sounds can be deleted and replaced via the Sound Manager software, which gives you access to Nord’s (rather incredible) Sound Library. There are plenty of varied sounds in Piano 3, especially considering its name. You’d think it concentrates on piano and it does, but on top of all of those piano variations you get strings, pads, brass, choirs, and much, much more. Indeed, the spread you get here is up there with what I played on the Stage 2 EX and, brass aside (of course), it’s all incredible. The depth of the notes on each sound is what hits you, as does the variation with velocity. Utilising the complete keyboard range, you will be startled at how deep some of these tones go and how true they sound. The real strings have an incredible character right across the range while the pads are as evocative as you could possibly wish for. Only the odd choir preset suffers from range issues, and only then at the very extreme ends of the scale. But it’s the pianos that we’re here for. As good as the rest of the sounds are – and as easy as those brass sounds are to replace with other sounds from Nord’s library – it’s the piano sounds combined with that keyboard action that you are really investing in this keyboard for. And I’m pleased to say that the sounds and action combined make for a hell of a playing experience. The keys have that pleasing heaviness and bounce back, the aforementioned dampening – or lack of it – per note is noticeable and the playing experience richer because of it. The piano sounds themselves are rich and varied – upright, layered, grand, classical – and the delicate action makes each one worth exploring for its subtle changes of expression. 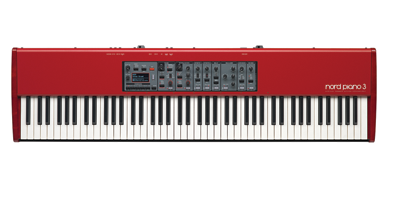 Nord promises that the keyboard action is as good as it gets and the results deliver. It’s subtle, as you might expect, but the variations deliver a genuinely ‘acoustic’-type experience. Effects 1 and 2 are especially glorious on the electric-piano type sounds, offering that deep chorusing and tremolo you really do need for dirt. The Reverb, however, turns your piano and string sounds into something otherwordly. Effects are very easy to step through and increase or decrease in depth, and to have all three on hand and so easy to implement is a joy. 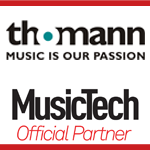 It’s been a while since we looked at any dedicated electric pianos, but for a fine piano action and sounds, the Roland RD-800 (10/10, £1,799 MT146) and Yamaha CP4 (9/10, £1,908, MT145) are still around. They lack the Nord’s added synth features, but are that bit cheaper. As I say in the main text, another alternative is Nord’s own Stage range. I looked at the Stage 2 EX HP76 over a year ago now and it has some incredible hands-on control as well as a great keyboard – although it’s not quite up there with the Piano 3. Like no other Nord, Piano 3 is a player’s keyboard. The finesse and sensitivity Nord has implemented will be best enjoyed by those who can play. For those of us who lke Nord’s other sounds, they’re here, but to get the best from them with other controls (pitch and mod wheels included) you’ll be better off with a Stage. 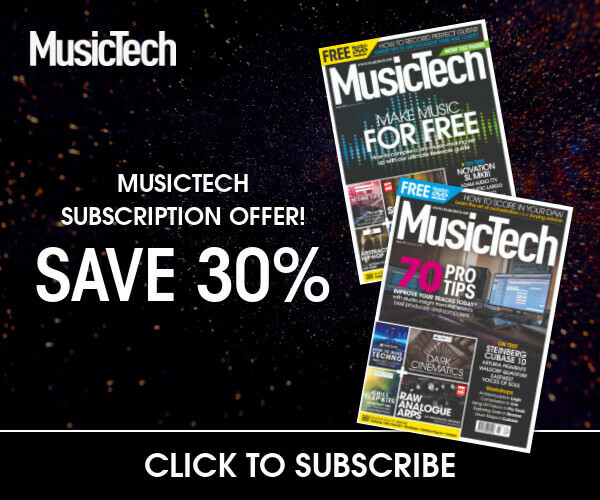 Organists and synth heads will particularly enjoy the drawbars and synth controls that range offers and the high-quality keyboard – it also sells for similar cash. But if piano is your thing and you rate yourself as a player, the keyboard experience doesn’t get better than this; nor does the feeling and emotion you can wrestle from it. Possibly the best piano you can buy that isn’t made of wood.